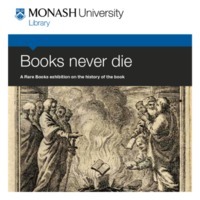 The exhibition was held in the Rare Books Exhibition space, Sir Louis Matheson Library, Monash University from 14 June - 7 September 2012 Opening address given by Shane Carmody, Director Development, State Library of Victoria. This exhibition is a celebration of the book over six centuries. Rare Books collects books about books and representative items to show the historical development of book production through the ages.